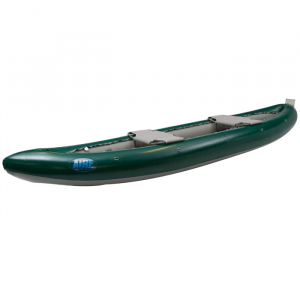 Aire TravelerInflatable Canoe -The Traveler inflatable canoe from AIRE is popular with families, hunters and anglers. Its great stability and large load capacity mean no more tipsy handling. A heavy-duty PVC outer shell provides superior durability, and airtight internal bladders provide an extra measure of strength and safety. The Traveler comes standard with two adjustable/removable seats. With a roomy interior and multiple tie-down loops, there's plenty of room for gear on solo self-support trips. Add a small motor on the transom for moving quickly across still water. At the end of the day, roll the Traveler canoe up and stow it your trunk or closet. 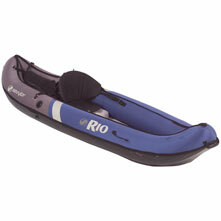 The AIRE Traveler tandem inflatable canoe can take you from the mountains to the sea, and every waterway in between. 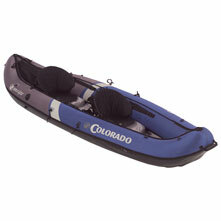 The AIRE Traveler Canoe's great stability and large load capacity make it a hit with families, hunters and anglers. 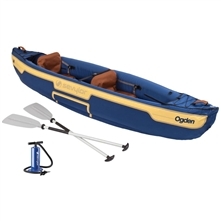 It excels on gentle streams, but handles flatwater and light whitewater too. A well-defined keel aids tracking on flatwater and slow-moving streams. Air-tight thermo-welded polyurethane AIREcell bladders line the tough PVC outer skin for a reliable, durable, and easily repaired boat. 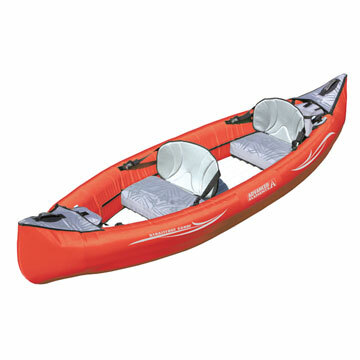 The Traveler comes standard with two removable and repositionable bench seats that can be used for solo or tandem paddling. Six D-rings for rigging gear and two carry handles make for easy carrying to the water. Two sets of drain holes ensure a dry ride when you're in the splash. Rolls up easily to fit into a car trunk with room to spare.